What is systemic lupus erythematosus, or lupus? Lupus is an autoimmune disease, which means that the body's natural defense system (immune system) which is designed to attacks foreign substances in the body like bacteria and viruses, with Lupus it attacks its own healthy cells and tissues. This causes inflammation. Inflammation causes swelling, pain, and tissue damage throughout the body. If you develop severe lupus, you may have problems with your kidneys, heart, lungs, nervous system, joints, skin, brain or blood cells. Lupus is the common name for systemic lupus erythematosus, also called SLE. Although some people with lupus have only mild symptoms, the disease is lifelong and can become severe. But most people can control their symptoms and prevent severe damage to their organs. They do this by seeing their doctors often for checkups, getting enough rest and exercise, and taking medicines. This topic focuses on systemic lupus erythematosus (SLE), the most common and most serious type of lupus. But there are four other types of lupus: discoid or cutaneous lupus, drug-induced systemic lupus, neonatal lupus, and subacute cutaneous lupus. Anyone can get lupus, but it most often affects women. Lupus is also more common in women of African American, Hispanic, Asian, and Native American descent than in Caucasian women. The exact cause of lupus is not known. Experts believe that some people are born with certain genes that affect how the immune system works and that they are more likely to get lupus. Then a number of other factors can trigger lupus attacks. These include viral infections, including the virus that causes mononucleosis, and sunlight. Although these things can trigger lupus, they may affect one person but not another person. Lupus symptoms vary widely, and they come and go. The times when symptoms get worse are called relapses, or flares. The times when symptoms are under control are called remissions. 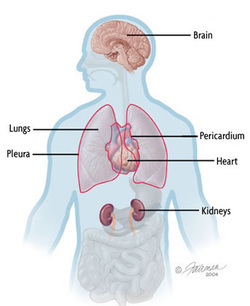 Over time, some people with lupus have problems with the heart, lungs, kidneys, blood cells, or nervous system. Because corticosteroids are powerful medicines and can cause serious side effects, the doctor will recommend the lowest dose that will give the most benefit. The doctor may also recommend other medicines that slow down the immune system.